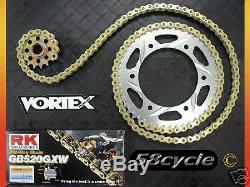 Custom Made 520 Conversion Kit with Vortex Sprockets and RK Racing Chain! By converting to a 520 setup you will not only replace your existing setup with the best looking chain and sprocket set on the market... You will reduce weight (over 1.5 lbs), heat, & friction while increasing horsepower (to the rear wheel). This RK GXW XW-Ring Racing Chain reduces friction (drive chain resistance) by over 50% when compared to a standard O-ring chain. The Vortex front sprocket is machined from the highest quality steel. Case hardened and precision cut with less than. The Vortex rear sprocket is computer designed and machined from the highest quality 7075 aerospace aluminum. Saber tooth grooved for self-cleaning and electrically coated for a brighter finish. 99-09 SV650S SV 650S (15/44-factory)! 1-Vortex Front Sprocket: 14, 15, 16, or 17 teeth! 1-Vortex Rear Sprocket: 44, 45, or 46 teeth! 1-RK 520 GXW, 120 link X-Ring Chain with Rivet X-Ring Master Link. This chain has Gold colored inner and outer connecting links! A 120 link chain is a few links longer than your factory chain and essential when adding teeth to the rear sprocket or with an extended swingarm. Intended for street or race use but not pactical for drag racing applications because of wear. The increase in power of 520 systems is found in acceleration from slow to low speeds and not dead starts. (8800 lbs of tensile strength)! 6-pack of Colored Billet Aluminum Sprocket Nuts available in our other auctions! To find a Chain Cutter / Riveting Tool! The item "SV650 VORTEX Sprocket / RK Chain 520 Conversion Kit SV Front Rear 99-09" is in sale since Wednesday, March 9, 2016. This item is in the category "eBay Motors\Parts & Accessories\Motorcycle Parts\Drivetrain & Transmission\Other Transmission Parts". The seller is "58cycle" and is located in Danville, Virginia. This item can be shipped to United States, Canada, United Kingdom, Denmark, Romania, Slovakia, Bulgaria, Czech republic, Finland, Hungary, Latvia, Lithuania, Malta, Estonia, Australia, Greece, Portugal, Cyprus, Slovenia, Japan, Sweden, South Korea, Indonesia, Taiwan, South africa, Thailand, Belgium, France, Hong Kong, Ireland, Netherlands, Poland, Spain, Italy, Germany, Austria, Mexico, New Zealand, Philippines, Singapore, Switzerland, Norway, Saudi arabia, United arab emirates, Qatar, Kuwait, Croatia, Malaysia, Brazil, Colombia, Bahamas, Viet nam, Israel, Ukraine, Bahrain, Chile, Costa rica, Panama, Trinidad and tobago, Guatemala, Honduras, Jamaica.